Solomon has selected 12 journalists to participate in their grant-funded training programme to boost diversity and community storytelling in Greek media. 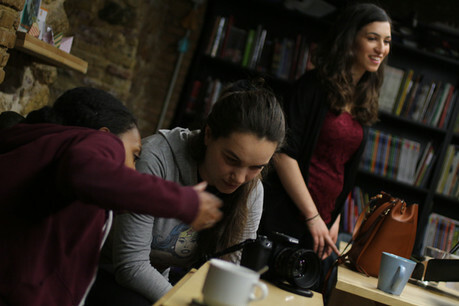 Six journalists from Greece and six from around the world will complete free workshops in storytelling, photography and film-making with a 50-50 split between men and women. The Greek-based non-profit organisation secured a €42,000 grant from the Engaged Journalism Accelerator (EJA) in October 2018 to run the six-month programme. It is one of the first four recipients of the new grant scheme run by the European Journalism Centre. The accelerator aims to fund projects with a focus on increasing expertise and introducing technology to community-orientated journalism. Starting in December 2018, the 12 journalists will spend the first three months of training in Solomon Lab. This part will focus on the theoretical and practical aspects of storytelling, photography and film-making, with guidance from three experts in the field. They will put those skills to use over the final three months, collaborating with other freelance journalists to produce stories for Solomon Mag, their content platform. “The first month is dedicated to storytelling in order to have the time to find the perfect story they want to create, and start working on it for five or six months,” explained Fanis Kollias, founder and managing director, Solomon. “We are trying to get into the field of slow media, to adapt this to the Mag by investing more time, energy and known associates to journalists who have the time to explore the topic, to do research and interviews and present a lot of different perspectives on a topic." The project follows the first episode of their documentary series ‘Immersed’, which looks at the underrepresentation of foreign journalists in Greece, as further testament to Solomon's stance on social inclusion. The ‘stories in a sunken world’ will look to surface community stories which are drowned out in the news cycle. Journalists participating in the workshops will also learn how to get to grips with the slow media style. After the entire six-month programme, promising journalists could be considered for projects with Solomon Cue, the production brand of Solomon. This produces commissioned content for other non-profit and commercial organisations, such as UNICEF and Airbnb. It is an important part of its revenue model because Kollias recognises they are currently reliant on grants. "We are aware that money from Cue is not able to cover the expenses of Lab, Mag, Cue, Solomon, the organisation etc.," said Kollias. "We have to find alternatives both for Lab to generate income and Mag, maybe with members in the future. We try to avoid advertising." Previous workshops have been grant-funded by the START programme and the Open Society Foundation. The second round of EJA funding is now open for organisations to apply for up to €50,000 for projects ‘with a proven record of sustaining a loyal community and a willingness to develop a resilient business model’. Deadline for submissions is 5 December 2018. For more information on other active grants that could kick-start your next project, head over to our awards page.